Fantastic things are happening in the Olympic lifting world! Having lifted more than double bodyweight, many strength athletes now have set their sights on a triple-bodyweight Clean and Jerk. Here are some tips on how to increase your power for the Clean. No article in years has stirred up such a hornet's nest of controversy as the one we recently published in this magazine concerning the triple-bodyweight Clean and Jerk. Sept. 1958. "Which Country Will Make the First Treble-Bodyweight Clean and Jerk." Feb. 1959. "How to Train for the Triple Bodyweight Clean and Jerk." The possibility of such a fantastic lift has stirred the hearts and fired the imagination of weightlifters all over the world. Enthusiasts from Fairbanks, Alaska to Pretoria, South Africa are demanding to know more on this subject. While many of the letter writers range from the skeptical to the downright indignant, most weightlifters are of the opinion that the triple bodyweight Clean and Jerk is definitely possible. "Dear Mr. Expert," writes a lifter . . . "Since no one has ever performed a triple-bodyweight Clean and Jerk, and since no known technique exists to make such a lift possible, what method can you devise that will make the lift at all possible?" Well, you've put us on the spot. However, since we plainly pointed out how a triple-bodyweight Clean and Jerk could be performed, we will explain equally how the beginning half of the lift can be done . . . how a triple bodyweight Clean can be trained for. We already know that it is humanly possible to lift triple bodyweight in a Front Squat! At least four internationally known lifters have accomplished this and can certainly be depended upon to succeed with even higher poundages in the future. Also in the bantamweight division, both the Korean, Yo In Ho and the American, Chuck Vinci, have also made Front Squats with about 370 lbs, while in the middleweight division (165-174 lbs), Tommy Kono has made a Front Squat with nearly 500 lbs. It must be obvious to all of you that as regards lifting triple-bodyweight the stars are just about ready to break the barrier. And it is through their wisdom in training according to basic power methods that this tremendous and thrilling feat will assuredly come to pass. 1) The bar must be pulled upward with sufficient force and momentum to enable the lifter to hold or 'fix' the weight at the chest when in a deep squat or leg-split position. 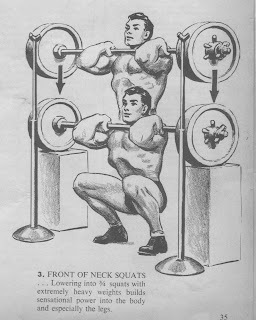 2) The lifter must -- through scientific training methods -- develop sufficient power in his thighs, hips and back, so that he can be sure of standing upright for the Jerk, without being exhausted. 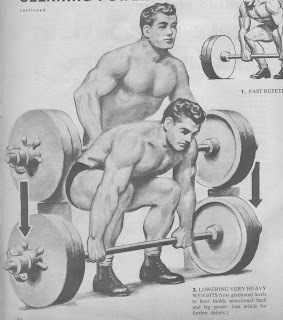 To accomplish the first of these stages, it is clear that the lifter must practice making upward power pulls from all angles and positions, because only through this training procedure can he develop enough muscular force to handle and sustain such large poundages. There must be all-around pulling motions for the arms. There must be fast deadlifts for building both coordinated back, hip and thigh strength; and for short, sudden bursts of power to make fast, powerful cleaning motions with great weights. Now, regular movements will not accomplish this, for extremely heavy weights cannot be handled. Therefore, we have devised a series of unusual movements which -- while performed by many champion lifters -- are not familiar to all lifters. These movements are all great basic, power movements and faithful performance of them will build you the needed power to clean and support much bigger poundages. WHAT ARE THESE UNUSUAL MOVEMENTS? 1) Fast Repetition Deadlifts From Graduated Levels. Progressively shorten the range of motion of the exercise by raising the starting point of the bar, all the while continuing to increase the poundage. At first, low (6-8 inch) blocks are used; then foot-high blocks, continuing on in this manner as greater and greater weights are used. Now, when you have continued to increase both the height of the supports and the poundage on the bar and no further gains in strength seem forthcoming, you still have an ace up your sleeve. You can do the deadlift in reverse which will build even more terrific back, hip and leg strength; and use this in a combination with reverse cleans to build equally terrific arm and shoulder strength so essential in certain parts of this lift especially where confidence is concerned. Load the barbell on sturdy boxes at about hip height, so that as you grasp the bar you are standing in an erect or nearly erect position. Now lift the weight just slightly up from the boxes and lower (or 'reverse deadlift') it to the floor, lowering the weight to the floor as slowly as possible. In this way you can overcome almost an sticking point in hip/leg/back weakness and handle heavier weights than are possible in the regular deadlift. Progressively work up to the heaviest weight you can over 6 to 9 single repetitions. After you have done this phase of the movement, then you are ready to give your shoulders and arms an extra power boost. With the barbell still on the hip-high boxes -- but this time with considerably less weight on the bar -- bend the arms somewhat and lift the bar slightly upward until it just clears the boxes, then lower it to the floor slowly (with arms held slightly bent for as long as you can), fighting the weight all the way down, working up to a maximum weight over 6 to 9 single repetitions. Naturally, you cannot be expected to perform either phase of this exercise in sets and repetitions. But if you can arrange to have two lifting partners to reset the barbell on the boxes, you can get more out of the exercises than when you have to re-assemble it yourself. 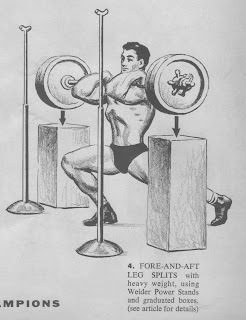 If you do have to remove weight before returning the bar to the boxes, make sure to make each single repetition count. Note: I've found that I can manage lifting the loaded bar back onto support boxes quite easily if I do it one end at a time. Just lift the right side of the bar up onto the box, then the left. Just a dimwitted tip for any lifters out there who, like me, have for the most part trained alone at home for decades. In this exercise you will need squat stands and two strong boxes (or a power rack). 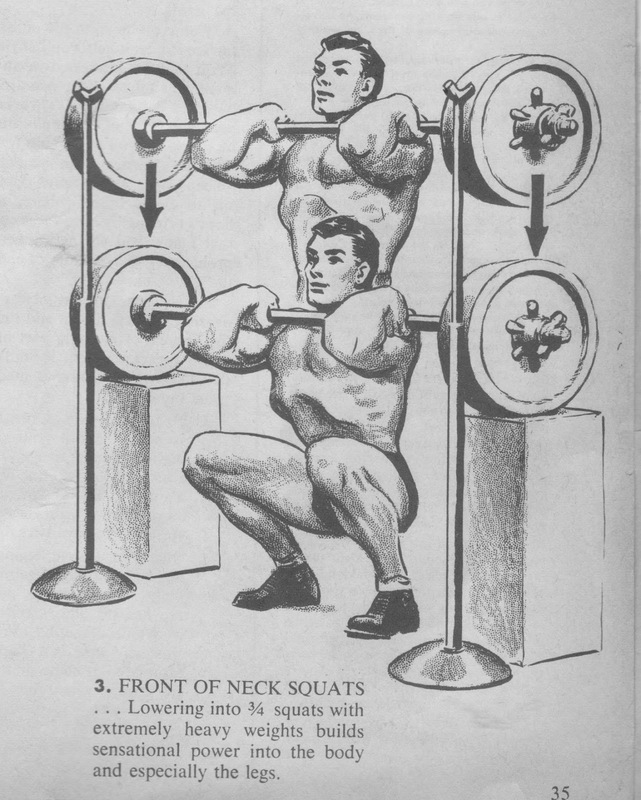 Adjust the squat stands to the exact height at which you hold the bar on the chest when making front squats. Adjust the boxes to the exact depth to which the plates of the barbell descend at the lowest point of the full Front Squat. Now, using the heaviest weight you can possible handle, take it off the squat stands . . . bend the knees s-l-o-w-l-y and lower into a full front squat until the plates touch the boxes. You are not to complete the squat . . . that is, you go fully down but you do not return to the starting position. This builds power into the legs and accustoms them to handling the heaviest poundages. Always use the heaviest possible weight in this movement and keep increasing the poundage as often as possible. Do 6 to 9 single repetitions in this exercise. Now, when you have completed your quota of single repetitions in the assistance (negative) Front Squat, you can remove some weight from the bar and perform 3 sets of 3 repetitions each in the Half Front Squat. And you will use boxes in this exercise adjusted to exactly half-front-squat depth to make sure that your lifts do not go lower than necessary to perform the half front squat. On the days when you have some extra energy left after this, you can perform the Regular Full Front Squat. Try 3 sets of 3 reps if you can make it. Occasionally, you might like to perform full back squats either as an alternate to the front squats, or as an "extra" if you're just bursting with latent strength. In this exercise you will again need squat stands. The idea is to help you become accustomed to handling heavier weights in the fore-and-aft position of the legs during this phase of cleaning split style. Your boxes and blocks will come into good usage here, for the technique is to gradually and progressively maneuver the heaviest weight into a lower and lower split position until you can easily encompass the full range of the split with the heavy weights you are working toward. First, adjust the boxes to their highest point. Take the weight off the squat stands, go into a split until the barbell plates touch the boxes. Now continue lowering and raising while in this split position, making sure that the plates just barely graze the surface of the boxes. This builds great tensile strength and flexibility. Put in place boxes of lesser height and do the same thing . . . and continue in this manner until you can do the deepest split with the heaviest weight. The boxes protect you from injury that might come from a too-sudden and too-deep lower of the weight. Try about 4 sets of 5 repetitions at four different box heights . . . one set to each height of support. And, to make sure that the greatest degree of strength and flexibility is built into the legs, practice this exercise both with weight held in front of the chest and on the back of the shoulders. As you can see, the sticking point of the extremely heavy Clean invariably occurs at the vital half-way point in the lift. That's why the champion lifters who will make a triple bodyweight Clean and Jerk will have to attack the problem systematically to build a steady growth of extra strength. The methods they use include the ones I have given you here. And you . 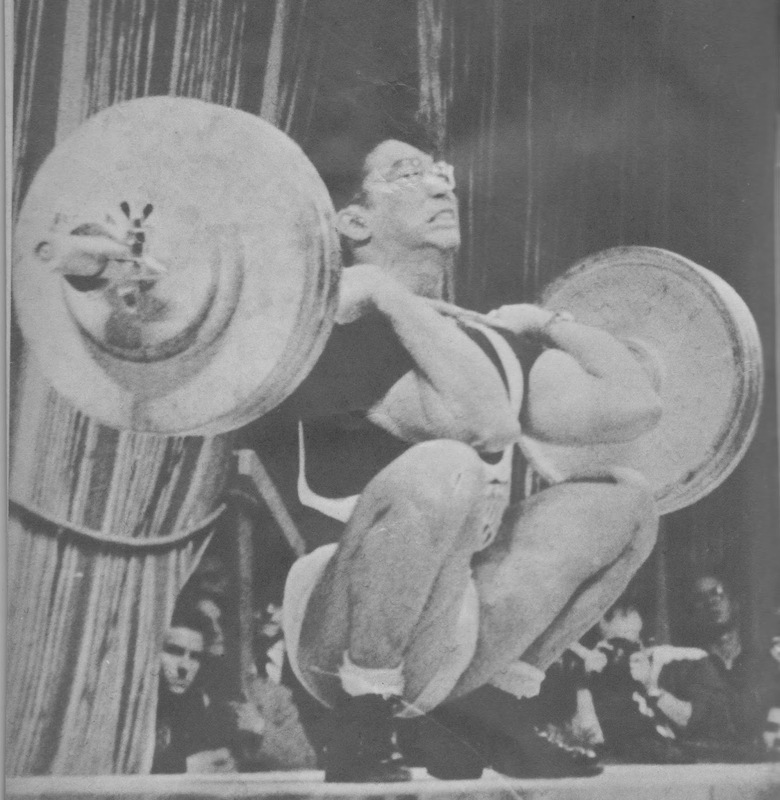 . . even if you have not the slightest intention of competing in Olympic lifting, can use the techniques described here to build great reserves of power and energy and magnificent muscle beyond anything you ever thought possible.